There was a time when young girls everywhere felt Joni Mitchell was talking directly to them through her intimate recordings filled with achy lyrics about yearning, heartache, disappointment, and rivers to skate away on. Hard to imagine the singer-​songwriter just turned 74. 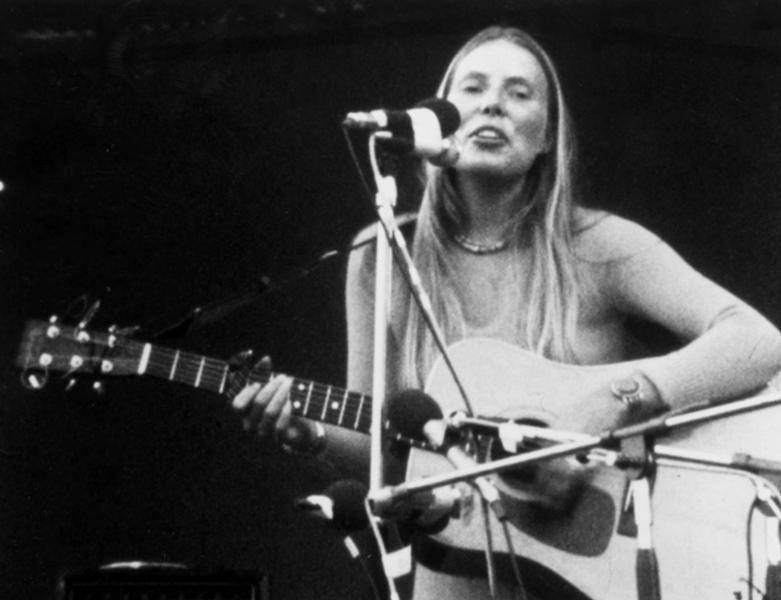 Joni Mitchell (Roberta Joan Anderson) was an only child born into a conservative household in the prairies of Saskatchewan. From an early age she questioned authority, chafed at her parochial education, and craved bold art. Busting loose was only a matter of time. The scrappy painter, poet and self-taught musician eventually landed in Southern California where she became a touchstone for the Woodstock generation. Rolling Stone magazine now ranks her among the top 10 best songwriters of all time, and in 1997 she was inducted into the Rock and Roll Hall of Fame. She’s received nine Grammy Awards including a Lifetime Achievement Award. For his biography “Reckless Daughter: A Portrait of Joni Mitchell,” David Yaffe interviewed dozens of musicians, friends and lovers from her past, but more impressively he conducted long interviews with the press-shy legend in person. He found her provocative from the start, first meeting with her in 2007. “A devastating mimic and raconteur, she serves up Dorothy Parker-like zingers with terrifying speed,” he recalls. A music critic and university professor, Mr. Yaffe has authored two other substantial books, one on jazz history and the other on Bob Dylan. This one — a more than decade-long labor of love — is equally comprehensive. He shows a deep appreciation for her music, analyzing every album as she evolves from folk to pop to rock ’n’ roll to jazz. And though Joni Mitchell lost some of her early fans with her switch to experimental, jazz-infused work, Mr. Yaffe fell more in love with her. Reading about her contempt for music industry execs, as well as her struggles to forge a path in such a male-dominated field — in the context of the recent onslaught of sexual harassment accusations — was somewhat head-scratching. One incident involving Miles Davis she recalls as humorous. He was a lifelong idol of hers and she hoped to collaborate with him. But when she found herself on his couch, “he came on to me,” she says. But, she explains, he was old and impaired by drugs and just passed out with his hands around her ankles. Were there other incidents that did not end so well? Maybe, but she does not reveal them. You do get the feeling Joni Mitchell could be a beast. The book documents this in all aspects of her life. If she did not like the way things were going — in her relationships or her craft — she walked out the door or kicked people out. She’s also a grudge holder, wanting to set the record straight about some (real or perceived) affront by, among others, Joan Baez, Judy Collins, Chrissie Hynde and Jackson Browne. She admits to a lifetime of severing friendships. While the book is not gossipy, it discusses her string of lovers: Leonard Cohen, James Taylor, David Crosby, Graham Nash, Warren Beatty, Sam Shepard, to name a few. There was a bad first marriage (where she picked up her famous surname), and semi-successful second marriage to producer Larry Klein (13 years her junior). Joni Mitchell is clearly a survivor. She had childhood polio, a late-in-life miscarriage, Morgellons disease and, in 2015, a brain aneurysm. She admits to smoking since she was 9 years old (at one point, four packs a day), which caused the loss of her soprano range by 1976. Another poignant thread running throughout is the daughter she gave up for adoption, first openly referring to her in the 1971 song “Little Green.” Ms. Mitchell claims, “Music was something I did to deal with the tremendous disturbance of losing her.” They reconnected many years later, but the relationship remains troubled. Fortunately the musician (who Mr. Yaffe calls “our eternal singer-songwriter of sorrows”) has found new joy in her life: a grandson and granddaughter. While rabid Joni Mitchell fans may already know the details of her “reckless” life, Mr. Yaffe paints a vivid portrait of this bold artist. Carol O’Sullivan is a freelance writer living in Pittsburgh. She owns vinyl copies of eight Joni Mitchell albums. This article has been viewed 1,566 times since being added on November 19, 2017.